Where Do I Enter My MLB.com Coupon? Shopping at the official mlbshop.com site should be a breeze. It’s well laid out (the same company who runs the online MLB shop also runs the online shops for NHL, NBA, and NFL) and easy to navigate. This article answers the question “where do I enter a coupon on mlb”? Depending on how hard you look, you should be able to find some good valid coupons at the larger coupon sites. When ready to make a purchase, you can enter the coupon code on the CART page, before you hit the button that says PROCEED TO CHECKOUT. Look for the grey box that asks “Using a promotional code?” Enter your code and hit APPLY. You can usually only use one code per purchase, and you will be told what deal you are getting immediately. Entering a new code after already receiving a discount may result in losing the previous discount so don’t be greedy. If you want to change the coupon code you are using you can click the DELETE THIS PROMO link, and start over. 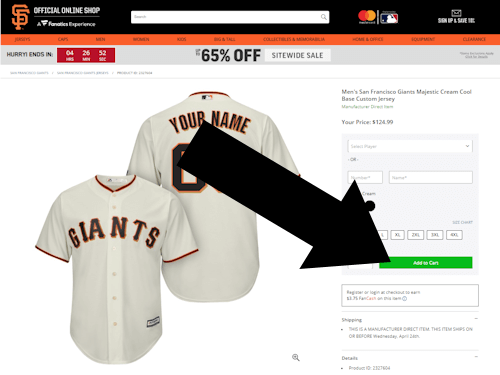 notice: Did we answer your question “Where do I enter a coupon on mlb“? Please let us know on the right hand side of this page under ABOUT THIS TUTORIAL. You will have another opportunity to enter a promo code during the checkout process. But not until after you’ve entered your shipping information. On the page where you are to enter your payment information there is a box that once again prompts you for a promo code and lists the deals already applied. If you’ve got a Gift Card or Gift Certificate then the place to enter these is on the PAYMENT OPTIONS page. The same page where you would normally enter your credit card information. This is near the end of the checkout process so don’t be anxious, you will have the opportunity. Look towards the lower portion of the page, after the paypal and billmelater options are provided. This tutorial was last verified on Apr 16, 2019 @ 8:10 pm.